Just add water to the line, shake and spray. Experiment freestyle or on a stencil. Perfect for sidewalk art. Contains. 0.35 oz of powdered chalk. The less water, the more intense the color. Outdoor use only. Assorted colors. to fly! Metallic foil construction. Dig and Discover this nifty little penguin. Use the included digging tool to scrape away the plaster to fexcavate the pengion model within. Final penguin model is approx. 2" tall. Discover the fun of magnets. This 24 piece set has an assortment of 23 magnets in 9 different designs plus paper clips for pick-up play. 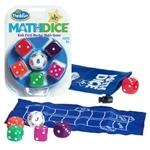 Roll the 12-sided Target Die to get your target number, then roll the five 6-sided Scoring Dice. Using addition and/or subtraction, combine the Scoring Dice to match the target number, moving one space on the Scoring Track for every Scoring Die used. The first player to reach the finish line wins! diagrams, and lesson plans on what happens as ice forms. Open up the tin, lay out the 12-piece oval track, assemble the toy train and watch it go! A great little toy for an executive's desktop or just for kids. Set includes 12 piece Oval track, Working locomotive (powered by 1 'AA' battery, not included), coal car, cargo car, and caboose. magnets, and two round magnets.